The K-20 has been called a real “game changer” by the ISUP manufacturers. Pumping up your ISUP is reputedly the least enjoyable part of boarding. With its unique patented design it is easy to inflate your board even up to 20 PSI or more. It is literally so easy that small children can easily achieve 20 PSI. This is a true two stage pump and not a “two way” pump. The high volume stage helps you shape up your board quickly to about 5/6 PSI and this is where most of the competition stalls out. With a simple twist of the handle the high pressure stage engages and you can easily continue to your desired PSI level. Super easy to operate, lightweight, and compact this pump has set a new standard for SUP pumps. 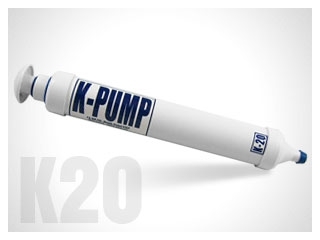 K-Pump's are proudly made in the USA and have a 2 year Warranty!